We’d love your help. Let us know what’s wrong with this preview of Twisted by Jo Gibson. I found this one really dull, and it just couldn't keep my interest. Even when people died, I was bored. Can't say I'm looking forward to the next one in the Twisted bind up. This one was just as dull as the last one unfortunately, and again, It didn't interest me even when people died. Glad I've only got one more book in the bind up to read. This was again another dull read, but I wasn't expecting much else from it to be honest. Twisted is a three-in-one thriller/mystery book. To be brutishly honest, I was neither thrilled, spooked, or surprised who the killers were. Predictability isn't a death knoll in a book for me... as long as I'm emotionally invested in the characters. I will give this book the tiniest illusion of the slightest doubt that because it was written for a younger audience is the reason why I found the characters so dull. Buuuut, I doubt it. ARC from publisher for honest review. This book was pretty good. The three stories were suspenseful, if not a bit lacking in depth. For instance the first short story was about some teen girls who were vying to be Queen of Hearts for a Valentines Day dance and one by one the girls who were in the lead were dying in unusual ways. I'm pretty sure the other girls in the contest wouldn't just pretend their friend didn't exist and be excited that now they are in the lead. It just seemed shallow. The s ARC from publisher for honest review. Since this is a bind up of three different books, I can be okay with them sharing similar themes, but this was basically the same plot recycled with each story. It was just so repetitive. Each one was a guy killing off a group of friends one by one and making the murders seem like accidents. I’m sorry, but there are only so many times that (view spoiler)[you can push someone down the stairs or cut brake lines (hide spoiler)]. Even the dialogue when they discovered the bodies was reused word for Since this is a bind up of three different books, I can be okay with them sharing similar themes, but this was basically the same plot recycled with each story. It was just so repetitive. Each one was a guy killing off a group of friends one by one and making the murders seem like accidents. I’m sorry, but there are only so many times that (view spoiler)[you can push someone down the stairs or cut brake lines (hide spoiler)]. Even the dialogue when they discovered the bodies was reused word for word in two of the books. Also, the killer was (view spoiler)[extremely easy to guess because none of the girls could have done it and you knew to exclude at least four people based on the formula (hide spoiler)] the author always used. All 3 stories in this bind up were the same story but with character and setting changes. The plotline were identical. Just the holiday was changed. And they all sucked. Would not recommend. If you see this book, run. Do not waste your time. I read 2 books in the Twisted compilation (The Seance and My Bloody Valentine) by Jo Gibson in about 4 days (I have NOT read Slay Bells yet). Each short story is really fast paced and easy. Overall I would recommend this book to a friend, as it was enjoyable, however I did have some issues with it. The stories are SO similar. It seems like between The Seance and My Bloody Valentine the only thing Gibson changed was the holiday, otherwise you basically have the same story (someone wants revenge, I read 2 books in the Twisted compilation (The Seance and My Bloody Valentine) by Jo Gibson in about 4 days (I have NOT read Slay Bells yet). Each short story is really fast paced and easy. Overall I would recommend this book to a friend, as it was enjoyable, however I did have some issues with it. The stories are SO similar. It seems like between The Seance and My Bloody Valentine the only thing Gibson changed was the holiday, otherwise you basically have the same story (someone wants revenge, starts killing people but makes the deaths look accidental). The Amy and Jennifer characters were exactly the same.... the good girl who is nice to everyone, who initially is in love with the popular boy (Brett/Tommy) but then ends up liking the underdog (Danny/Tim), and has an outspoken best friend who eats a lot and somehow ends up with the popular guy her best friend used to like (Colleen/Lexie). Another thing is that some of the dialogue, car brands and models, use of tape players, and the description of the fashions seem out of date, that's why I prefer when authors don't mention these things. Also, maybe because it was the 90s and heroin chic was "in," but I really did not like the emphasis on dieting and the "beautiful model face and skinny figure" that was basically every character. Plus both Amy and Jennifer's mothers were obsessed with dieting (another similarity between the 2 characters). I liked how the books kept me guessing about who the killer could be. I switched my mind multiple times while reading and was satisfied with the killer in MBV, the motive was great. But in The Seance I felt like the killer could have been someone better and I was somewhat letdown. In MBV the character was guessable but in TS the killer could've been multiple people and therefore the reveal felt very anticlimactic and as though the author just closed her eyes and pulled a name out of a hat, which is a shame because I felt the motive was good. 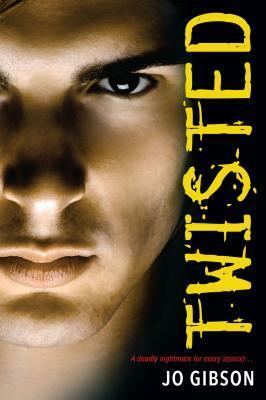 Twisted by Jo Gibson was a great Thriller/Horror book. It was three stories in one book: My Bloody Valentine, The Seance, and Slay Bells. It took three holidays, Valentines Day, Halloween and Christmas and put a horror spin on them and I thought each story was good. I really liked the fact that they were all holiday-themed. The stories seemed to me to be full length stories, not short stories. This makes for a great bargain, three books for the price of one. I thought all three stories were reall Twisted by Jo Gibson was a great Thriller/Horror book. It was three stories in one book: My Bloody Valentine, The Seance, and Slay Bells. It took three holidays, Valentines Day, Halloween and Christmas and put a horror spin on them and I thought each story was good. I really liked the fact that they were all holiday-themed. The stories seemed to me to be full length stories, not short stories. This makes for a great bargain, three books for the price of one. I thought all three stories were really good. They reminded me of old fashioned horror movies, which I’m a big fan of. They weren’t gory or gruesome but by the descriptive writing the scariness came through. At times the tension was palpable and I found myself having to turn the pages to see what would happen next. The writing style flowed easily and the wording was very descriptive and added greatly to the stories. I would recommend this book to anyone who enjoys Thriller/Horror books and old time horror movies. I think adults and young adults alike would enjoy this book. I will be getting more books by Jo Gibson to read. All three books are the same story with minor adjustments. There is a killer that leaves notes and makes the deaths looks accidental. Two stories had the characters stranded because of weather. there should have been more originality in the books. I liked the first story. The second was too similar to the first for me to enjoy. The third story might as well be the exact same story as the second. The characters were too superficial to be believable or relatable. "People are being massacred spoilers? "People are being massacred but oh em gee, Tommy is so cute but maybe I'm in love with Tim." This is a 3 in 1 murder/mystery/thriller book. Great read for anyone who enjoys suspense. There are 3 separate stories/books, My Bloody Valentine, The Séance and Slay Bells. I enjoyed the descriptive writing and suspense created. Each book had several “accidental” deaths involved with only the reader & killer knowing these “accidents” weren’t accidental. The killer’s identity was also mysterious until the end of the books. I enjoyed it and will recommend it to others! NOTE: I received a copy This is a 3 in 1 murder/mystery/thriller book. Great read for anyone who enjoys suspense. There are 3 separate stories/books, My Bloody Valentine, The Séance and Slay Bells. I enjoyed the descriptive writing and suspense created. Each book had several “accidental” deaths involved with only the reader & killer knowing these “accidents” weren’t accidental. The killer’s identity was also mysterious until the end of the books. I enjoyed it and will recommend it to others! While the plot was interesting, I found the reality to be stretched too thin to truly enjoy the stories.